The 2002 Karachi bus bombing was one of a series of deadly strikes on Westerners in Pakistan in 2002. The blast killed at least 15 people and another 40 were wounded. The attack took place in Karachi, Sindh. On May 8, 2002, a man driving a car bomb stopped next to a bus in Karachi outside the Sheraton Hotel. 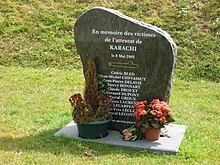 He detonated the car, ripping the bus apart, and killing himself, 11 Frenchmen, and two Pakistanis. The 11 Frenchmen were engineers working with Pakistan to design an Agosta 90B class submarine for the Pakistani Navy. About 40 others were wounded. Al-Qaeda was blamed for the blast. On September 18, 2002, a man named Sharib Zubair, who was believed to have masterminded the attack, was arrested. In 2003, two men were sentenced to death for the bombing by a Karachi court. The suspected bombmaker, Mufti Mohammad Sabir, was arrested in Karachi on September 8, 2005. There were several convictions in the case, though Pakistani courts acquitted three defendants by 2009. Contrary to official announcements by the Pakistani and the French governments at the time, it is now thought to be unlikely that those responsible for the attack had links to al-Qaeda. In 2007, anti-terrorism judge Jean-Louis Bruguiere, assigned to lead the investigation into the bombing, was replaced by two investigating magistrates, Marc Trevidic and Renaud Van Ruymbeke. The former opened a new line in the investigation: that the attack was linked to the halting of kickback. The resulting scandal has been dubbed "Karachigate". An investigation is currently underway in France to establish the extent to which former French Prime Minister Édouard Balladur and former French President Nicolas Sarkozy were implicated in the sale of kickbacks to Pakistani officials. Sarkozy was allegedly involved in accepting kickbacks from Pakistan to fund the presidential campaign of Balladur. When Jacques Chirac came to power, he cancelled the Pakistani official's kickbacks, angering those in Pakistan. ^ "USATODAY.com - Suspect arrested in attack that killed 11 Frenchmen". usatoday30.usatoday.com. Retrieved 18 December 2017. ^ Timeline: The Karachi bombing and kickback allegations France 24. ^ a b Villepin backs 'Karachigate' claims against Sarkozy The Independent. ^ a b "Submarines and subtext: Who's who in 'Karachigate'". France 24. Retrieved 6 November 2014. Timeline: The Karachi bombing and kickback allegations France 24.